River lamprey Lampetra fluviatilis is listed under Annex II of the EU Habitats Directive. River lampreys have a very poor swimming ability, limited climbing ability and are not able to jump. They cannot pass crump weirs and asimilar obstacles. It is also clear that the same will apply to Brook lamprey Lampetra planeri, which is a very similar species and has a similar difficulty in passing obstacles in rivers. 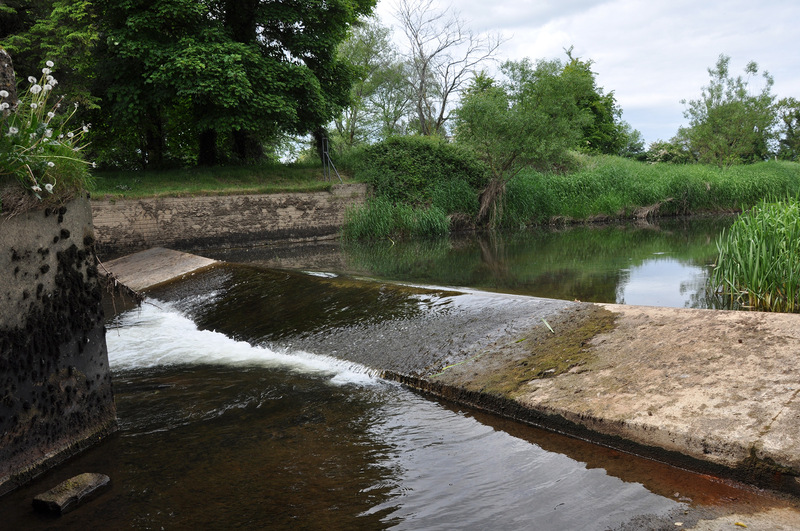 It is of concern that these crump weirs are being installed on Irish rivers for the purpose of counting salmon.The roll out of crump weir salmon counters (and hydrometric weirs) on rivers containing lampreys is a major issue for lampreys in Ireland – as at least two of the three Irish lamprey species cannot pass these obstacles, and the third species will have major difficulty over much of the hydrograph. The key paper regarding this is as is ‘Gauging weirs impede the upstream migration of adult river lamprey Lampetra fluviatilis‘ by Russon et al (2010). This study concluded that “gauging weirs may severely impede the movements of migrating adult river lamprey under low to moderate discharges“. It is clear evidence that hydrometric weirs and crump weirs have the potential to be significant obstacles to lamprey migrations. Hydrometric weirs are also a potential barrier to migrating lampreys: Clodiagh River at Rathkennan Bridge (River Suir SAC). It is noteworthy that these large chunks of concrete which are being being put into our salmon rivers by Inland Fisheries Ireland (when they can get away without having to apply for planning permission) to count salmon, but incredibly the counts from these facilities are generally not available. These are barriers to fish migration and block the migrations of lampreys, eels and other fish and no data from them ever seems to be available. Our rivers already have enough barriers to migration on them without installing more weirs in the name of conservation. Even if there were counts available to the public from these sites, setting targets for killing an Annex II species is not really conservation. It is clear that many of these counters – such as the one on the crump weir on the River Mulkear, Co Limerick – do not even work. Based on available scientific evidence salmon counters on crump weirs are a serious risk to lampreys (and eels). 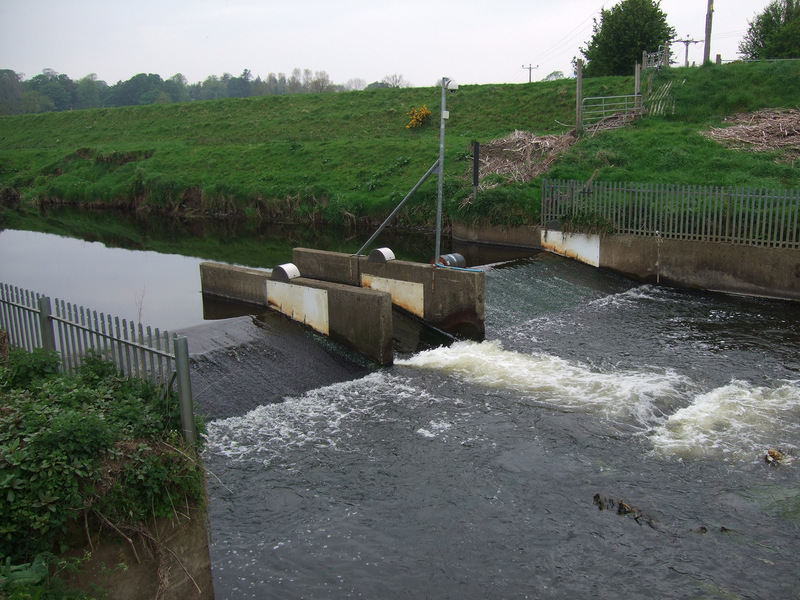 The crump weirs installed on Irish rivers to count salmon contribute nothing to conservation but add to fish migration issues. Crump weir and fish counter on the River Roe, Northern Ireland. Impassable barrier for lampreys and eels? Ornamental weir / samon counter on the R. Strule, Omagh. 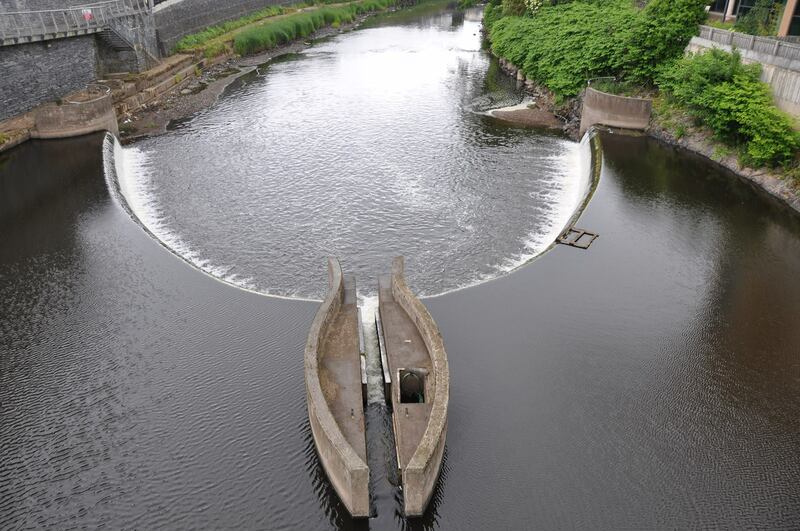 This weir is a barrier to both lampreys and eels. This crump weir and salmon counter on the Mulkear is probably a barrier to broo lampreys, river lampreys and eels. The salmon counts from this site are not available – does this counter even work? River (and brook) lampreys also cannot use many of the fishways (or fish passes) that have been installed at weirs to help species such as salmon and trout. They have almost no ability to pass denil or ‘pool and weir’ passes according to the paper ‘Extreme inefficiency of two conventional, technical fishways used by European river lamprey (Lampetra fluviatilis)‘ by Lucas and Foulds (2013). 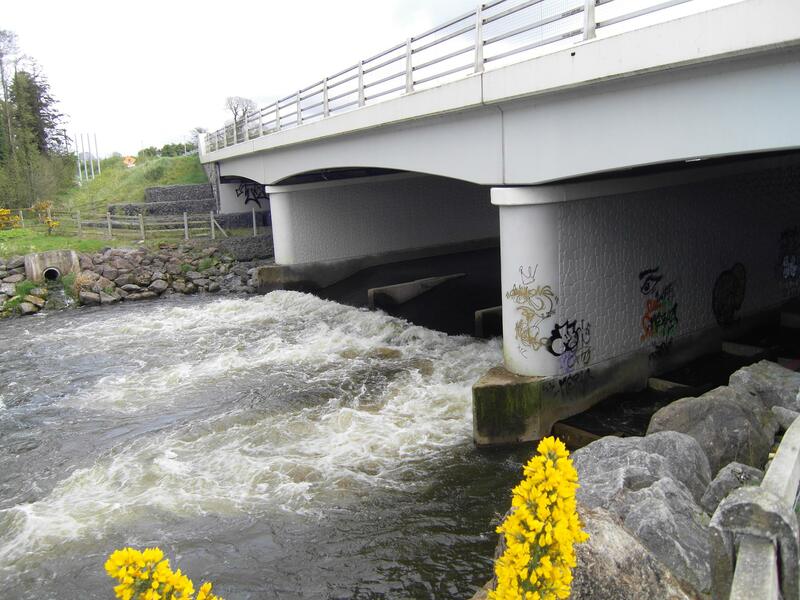 There is no real evidence that river and brook lampreys can pass Larinier type passes such as the one recently installed on the River Fergus in Ennis. The Environment Agency advise that a natural type bypass channel is used for lampreys, such as a close to nature pass like a rock ramp. In fairness to the Loughs Agency, they provide salmon counts on all of the salmon counters they operate. However, if you look at their fish counter site at the link below, it is likely that every single one of these structures is impassible to river lampreys, brook lampreys, and also possible eels. Inland Fisheries Ireland don’t generally make their salmon counts available, and it is clear that many of their counters do not even work. However, most of them are causing passage issues for lampreys and eels.